Determined to turn around his ‘awkward-guy-nothing-special’ image, Reginald McKnight tries to channel his self-created superhero comic persona, Night Man, when he gets up on stage to recite the school pledge on the first day of school. However things don’t go as well as he hoped – puking on stage during assembly is not exactly the best way to start off the eighth grade – and Reggie ‘Pukey’ McKnight resigns himself to spending the rest of the school year keeping a low profile and dodging his nemesis, Donovan. However, things begin to change for Reggie when his church’s youth group becomes involved with a local homeless shelter. Reggie befriends George, a homeless man with a surprising story, who inspires him to do the most unimaginable thing ever: run for school president. Elections at Clarke Junior High have always been a popularity contest, but with the help of his two best friends, Joe C. and Ruthie, and the unlikely powers of a pair of “Dora the Explorer” sneakers, Reggie begins to think that he just might stand a chance of winning. Meanwhile, Reggie has other things on his mind: his father is out of a job, he has nagging questions about faith and God that no one can seem to answer, and his relationships with his best friends are getting complicated by race and romance. Will Reggie go from zero to hero in time for the Holiday Jam at the end of the year? And will he find out the answers to his questions about faith, identity, civic duty, and of course… girls? This book has an easy readability level for students who read at a fourth grade level and beyond. Some complex words (e.g. ‘defacement,’ ‘brownnosing,’ ‘paraprofessionals,’ ‘degenerate,’ ‘implode’) and context words and phrases (e.g. the Jamaican foods ‘festival’ and ‘ackee;’ ‘Montego Bay;’ ‘Rainbow Coalition;’ the ‘1812 overture,’ ‘NPR’) make this a good text for vocabulary development at the lower-middle grade level. Age-appropriate use of sight-words within the book. Age-appropriate use of literary elements. The book is rich with literary devices, especially symbols, idioms, metaphors, metonymies, similes and alliterations. The book also has numerous allusions, referencing places, current events, pop culture trivia, and literary works that will have been studied or touched upon in other parts of the middle and high school curriculum (e.g. the Black Panthers, NATO, UNICEF’s Convention of Rights of the Child, Gwendolyn Brooks’ “Speech to the Young: Speech to the Progress-Toward,” Harry Potter, The Godfather, Rosa Parks, Mahatma Gandhi, and Machiavellianism all crop up in the book.) Make sure to review allusions with students to increase comprehension and promote a more meaningful and cross-curricular reading experience. 1 . Get involved- Visit or volunteer at a local homeless shelter, convalescent home, soup kitchen, community organization, or a church that has a homeless ministry. 2 . Poetry- Do oral performances of (or act out) Gwendolyn Brooks’ “Speech to the Young: Speech to the Progress-Toward” and Claude McKay’s “If We Must Die” (both poems are quoted in the book.) Have a class discussion about these poems. 3 . Civic Engagement- Have a discussion about the rights and responsibilities of citizens in society, in the classroom and in the community. Make a book of rights and responsibilities for the classroom and the school community. Set in Brooklyn, this is a book that asks some serious questions about what it means to have a social conscience, to be part of a community, and to be a young person living in today’s world. Given the nuanced characters and novelistic length (324 pages) it’s not surprising that the book is being received as both a middle reader a young adult novel. 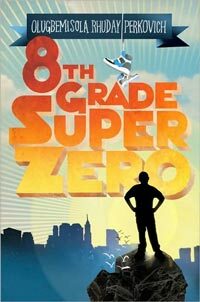 Although the characters are in the eighth grade, high school students will relate to their stories and to the day-to-day concerns and intrigues of their teenaged existence. This is a truly “twenty-first century” story that frankly captures modern society with all its unavoidable issues of race, identity, multiculturalism, faith, cross-generational strife, and technology, all seen through the eyes of believably flawed, yet refreshingly “conscious” teenaged protagonists. The author’s witty style often made me laugh out loud and the plot is so well-paced that despite its length, the novel never seems to drag. This is a bold debut from Rhuday-Perkovich that simply begs a sequel. Here’s an author interview worth reading. Here’s A wonderful video that describes the context, background, and spirit of the book and author. This is a must-watch video.